Apple has just made available for download iOS 9.3.4 IPSW links for iPhone, iPad, and iPod touch devices. Those of you who are looking to hop onto this latest firmware can now do so the easy way by simply using the OTA update method that should be available on all compatible iPhone, iPad, and iPod touch devices. Alternatively, there’s always the trusty restore method of using iTunes and direct-downloadable iOS 9.3.4 IPSW file for your device. iOS 9.3.4 release was almost inevitable, especially given the jailbreaking scene was really living it up with the recent Pangu/PP jailbreak for iOS 9.2-iOS 9.3.3 firmwares. 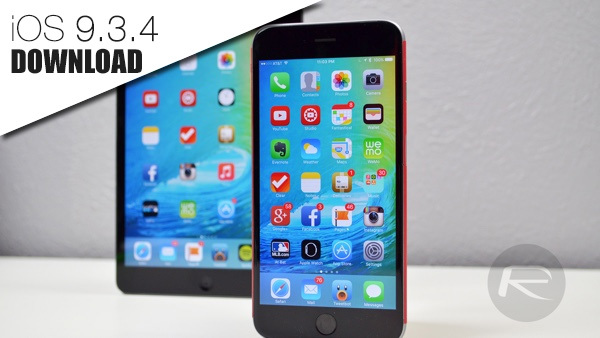 In that aspect, you maybe wondering what this latest iPhone/iPad firmware has to offer? 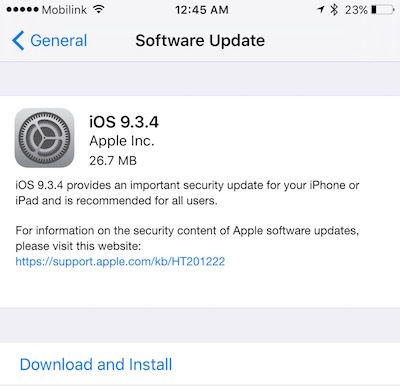 Well according to Apple’s official changelog for iOS 9.3.4, the new firmware is “an important security update”. So there you have it. If you care about jailbreaking, you shouldn’t update from iOS 9.3.3 to iOS 9.3.4 as it carries a patch that fixes the vulnerability exploited by Pangu in jailbreaking iOS 9.3.3. If jailbreaking is not your concern though, you can download the IPSW file of iOS 9.3.4 from the links given below to restore it to on your iPhone or iPad using iTunes. Or as mentioned earlier, simply head to Settings > General > Software Update on your device and grab the OTA update directly from there. The release of iOS 9.3.3 was expected to be the last update in the 9.x series, with Apple working hard at releasing beta versions of the September-bound iOS 10. However as mentioned earlier, after Pangu came knocking down all those walls built by Apple with its jailbreak tool, we now have iOS 9.3.4 from Apple putting the end to that jailbreak exploit used by Pangu Team. Update x1: iOS 9.3.4 has been jailbroken. You can find more details on it here.